Lipiderm is an Omega-3 and Omega-6 dietary supplement that supports healthy skin and coat, while helping to manage normal shedding in dogs. Gel caps can be given directly or punctured and mixed with food. For use in dogs. Made in the USA. 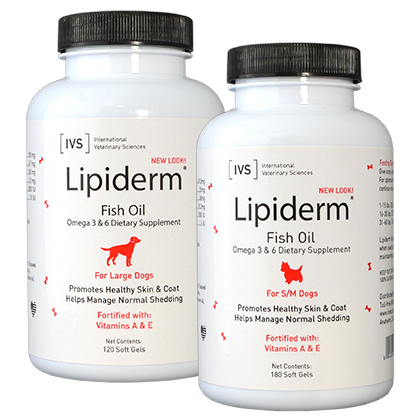 Lipiderm contains a natural source of Omega-3 & 6 Fatty Acids plus vitamins A and E to support healthy skin and coat in dogs. Available in small & medium, and large dog sizes, Lipiderm should be used for a minimum of 30 days and comes in gel caps. Lipiderm is a unique product which when used as directed, provides special nutrients for maintaining healthy skin and coat. Lipiderm Gel Capsules are nonprescription (OTC) products. The recommended dosage of Lipiderm Gel Capsules for Small and Medium Dogs is 1 soft gel once a day for dogs weighing 1-15 lbs, 2 soft gels once a day for dogs weighing 16-30 lbs, and 3 soft gels once a day for dogs weighing 31-60 lbs. The recommended dosage of Lipiderm Gel Capsules for Large Dogs is 1-2 soft gels once a day for dogs weighing 31-70 lbs, and 2-3 soft gels once a day for dogs that weigh over 70 lbs. Lipiderm Gel Capsules for Small and Medium Dogs and Lipiderm Gel Capsules for Large Dogs are unique products that provide special nutrients for maintaining healthy skin and coat. 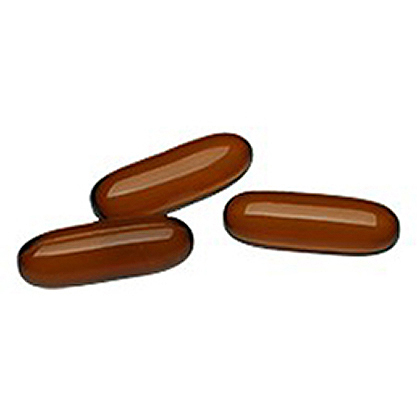 Lipiderm Gel Capsules for Small and Medium Breed Dogs and Lipiderm Gel Capsules for Large Dogs contain Omega-3 and Omega-6 fatty acids, Vitamin A, and Vitamin E.
Ingredients:Fish Oil (Omega-3 fatty acid source), Castor oil, Flaxseed oil, Linoleic Acid, D-alpha tocopheryl acetate (Vitamin E), Gelatin, Glycerin, Purified water, Safflower Oil, Vitamin A palmitate (Vitamin A), Caramel color. Ingredients:Fish Oil (Omega-3 fatty acid source), Castor oil, Flaxseed oil, Linoleic Acid (Ethyl Ester), d-alpha tocopheryl acetate (Vitamin E), Gelatin, Glycerin, Purified water, Safflower Oil, Vitamin A palmitate (Vitamin A), Caramel color.